Note: Pictures from Smartphone to Computer will be the beginner’s lesson topic for our Episode 34 “What Does This Button Do?” Internet show. You have a smartphone (or tablet) and you love taking pictures with it. You’ve racked up several hundred, maybe even thousands of snapshots and it may even be indicating that it is full! What now? How do you get them onto a computer so you can delete them from the phone? There are two general techniques: 1) Wired, and 2) Wireless. 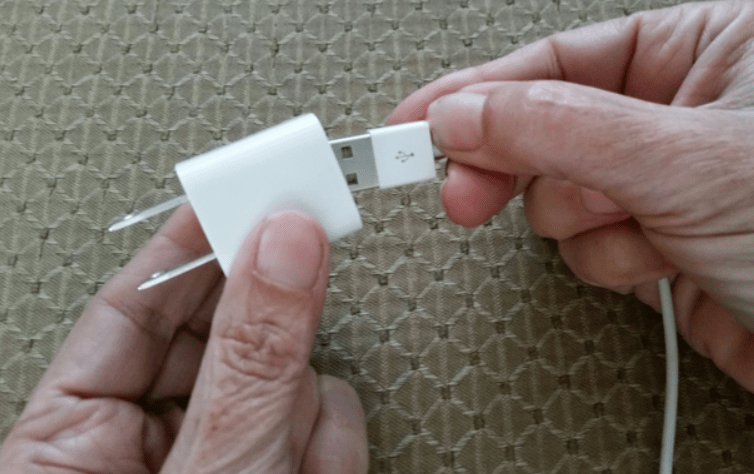 Via USB Cable: You know that power cable that comes with your phone or tablet? That is also a USB cable, just pull off the two-prong electrical plug that goes into the wall and it will reveal a USB plug. Attach the USB end into an open USB port on your computer and the other end to your mobile device. What happens next varies depending on your particular phone/tablet and the settings on your computer. Check the screen of your mobile device for a message like, “Trust this computer?” or “USB Connected, Tap for Options.” Then notice any pop up messages on your computer for further instructions. There are dozens of options depending on your particular setup so, if you don’t understand the messages you see, you should get more detailed instructions for your exact devices. 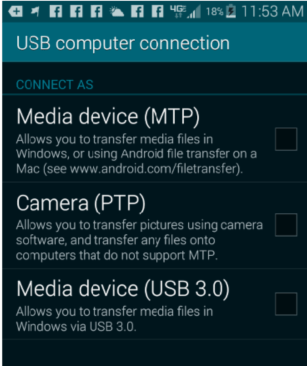 For example, you may Google for “transferring pictures from Motorola Droid Razr Maxx to Windows 8 via USB.” Once your mobile device is successfully connected to the computer, it should be seen just like any other camera or drive. You can then use your normal import pictures procedures (e.g. 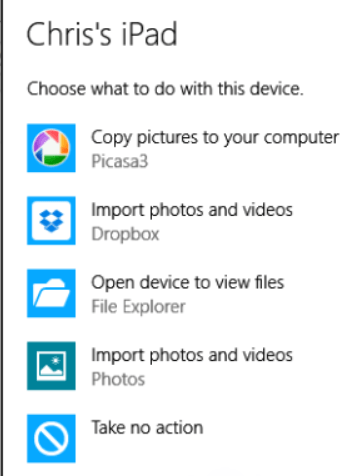 Picasa) or use Windows File manager or Mac Finder to copy pictures. Via SD Card: If your phone is storing your pictures on a microSD card, you can take that card out of the phone and plug it into the computer in order to transfer pictures. Before removing the card, you should either turn the device off, or UNmount the SD card. To unmount: Settings->Storage->Unmount SD Card. Then press the card till it springs out a little and you can grab it and remove it. You will probably need an adapter in order to insert this microSD card into the regular SD card slot in your computer. 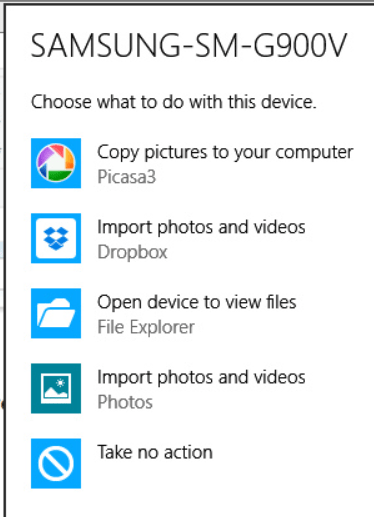 Once it is inserted, it should show up like any other camera card on your computer. Via Dual USB Drive: We’ve just discovered this nifty little device. It’s a normal USB ‘Flash’ Drive like any other that you can plug into the USB port on your computer and use like an external hard drive. The special difference is that, in addition to the normal USB connector, it also has a microUSB connector that can plug into the power port (micro USB) of your Android phone or tablet. Here’s a link to the Sandisk Dual USB Drive on Amazon. This only works on Android phones because they have the micro-USB connector (where you plug the power in), and it doesn’t even work on all Android. But it does work on my Samsung Galaxy S5 and Jim’s Samsung Note 3. We also got it to work on a friend’s Motorola Droid after downloading an App for File Management. When you plug it in, it first gets recognized as a USB storage device, then it opens the My Files app on your Samsung phone. Now it’s just like looking at a drive with a computer and you can cut, copy, or paste in either direction: from the phone to the USB Drive, or from the USB drive to the phone. Via Dropbox: This is the way we do it. Once you’ve set it up, there’s no more thinking involved. I take a picture with either my Samsung phone, or my iPad mini and, as long as I have an Internet connection, it will be on my computer in minutes! Here’s a past article that explains how to do that: Using Dropbox to get Pictures from your Smartphone. Via iCloud Photos: If you have all Apple devices, iCloud Photos performs the same function as Dropbox. It collects the pictures taken by each mobile device and adds them to the Photo Stream. The Photo Stream can then appear on any Mac or Windows computer. It does not work with any Android devices. Here is the Apple Support page on iCloud Photo Stream. Remember to watch Episode 34 of What Does This Button Do? We will demonstrate the above techniques on our live show Sunday April 5. See GeeksOnTour.com/WeeklyShow for the links to watch. Published by MrsGeek, in Blog. Tagged with #ButtonShow, #GeeksWhoTeach, #WDTBD, Android, Apps for Travelers, Backup your Photos, Droid, Google Photos, importing photos, iPad, iPhone, Smartphones, Technology for Travelers.